Rogier Bartels is a legal officer in Chambers at the International Criminal Court. The views expressed in this post (and in the article referred to, which was written before he joined the Court) are his own and do not necessarily represent the views of the ICC. He blogs at the Armed Groups and International Law Blog. On 8 November 1993, as part of the offensive, an HVO tank fired throughout the day at the Old Bridge until it was unusable and on the verge of collapse. The Bridge then collapsed on the morning of 9 November 1993. 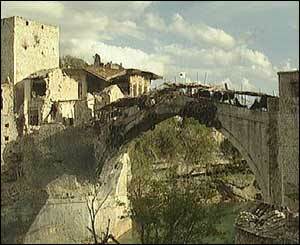 The Chamber finds, by a majority, with the Presiding Judge dissenting, that although the Bridge was used by the ABiH and thus constituted a legitimate military target for the HVO, its destruction caused disproportionate damage to the Muslim civilian population of Mostar (Judgement Summary, p. 3). In the article referred to above, I show that the Tribunal’s practice can be divided into three categories of cases where the different chambers: i) state and clarify the principle, but do not apply it to the facts of the case; ii) make findings on disproportionate or excessive use of force that cannot actually have resulted from an application of the principle; iii) the Gotovina case, in which the Trial Chamber did apply the principle to the evidence, but was then quashed by the Appeals Chamber. In this post, I will briefly discuss the ways in which the principle has been addressed in the ICTY’s case law in order to see where the Prlić case fits in. The principle of proportionality has hardly been dealt with by the ICTY. This is due in part to the relatively limited number of cases dealing with conduct of hostilities, and partly because the ICTY’s subject matter jurisdiction. The Tribunal’s Statute lists war crimes as “grave breaches of the Geneva Conventions of 1949” (Article 2) and “violations of the laws or customs of war” (Article 3). A violation of the principle of proportionality obviously could not fall under Article 2, as the grave breaches of the four 1949 Geneva Conventions are made up of an exhaustive list (Articles 50, 51, 130, and 147 of the Conventions, respectively)and the regulation of conduct of hostilities was not yet included in the grave breaches regime in 1949 (this was done in 1977 by means of Article 85 of Additional Protocol I). Since the crimes under Article 3 ICTY Statute are limited to serious violations of those norms of IHL that, at the time of the conflict in the former Yugoslavia, had beyond any doubt reached the status of customary international law (Report of the Secretary-General, para. 34), the Tribunal has not considered serious violations of in bello proportionality to constitute a separate crime. Quite the contrary, in fact: in its case law, such violations have merely served as evidence of the existence of attacks directed against civilians or against civilian objects. When the ICTY did address the proportionality principle in its case law, it did so firstly in cases where a legal analysis of what constitutes the principle was made, but in which the principle was not actually applied to the facts and/or evidence. Examples of such cases are Kupreškić, Galić, Strugar, Martić, and Dragomir Milošević. The customary status of the principle, and what it entails, was set out correctly in these cases – as also acknowledged by the ICRC Customary IHL Study (see the extensive reference to these ICTY judgements in the Study’s practice for Rule 14), which anyway relies heavily on case law of the ad hoc Tribunals. Particularly, the Galić Trial Chamber explained clearly what the principle entails and how the proportionality of an attack should be assessed (Galić TJ, paras. 58-61). Be that as it may, nearly all of these findings are no more than obiter dicta, as the concerning chambers did not actually apply the balancing test that underlies the principle (i.e. anticipated military advantage versus expected incidental damage) to the facts of the case. In Strugar, for example, the Trial Chamber explains what the proportionality principle entails, but then goes on to conclude that the principle did not arise in that case because no military objects were located in the old town of Dubrovnik, which was attacked by Serbian forces (Strugar TJ, paras. 214, 281 and 295). The second category of cases conclude that disproportionate or excessive force was used, but do not explain how the chamber arrived at this conclusion. Or, when such a finding was made, the chambers do not appear to have balanced properly the expected military advantage against the expected collateral damage. In Blaskić, Milutinović et al. and Đorđević, the respective Trial Chambers mention the use of “disproportionate force”, “force out of proportion to the military necessity” and “excessive force” numerous times (see, e.g., Blaskić TJ, para. 651; Milutinović TJ, para. 920; and Đorđević TJ, para. 980). And yet, these findings do not seem to have resulted from a proportionality analysis (the one that was correctly set out in Galić (para. 58)). In Blaskić, the Trial Chamber concludes that no military objects were attacked, and both the Kosovo cases do not even concern unlawful attack charges, but deal rather with the murder of detained persons and the deliberate destruction of civilian houses. In these three cases, the reference to disproportionate and excessive use of force thus indicates the manner in which the HVO and Serbian forces, respectively, used force, rather than the principle’s legal meaning as framed in Articles 51 and 57 of Additional Protocol I. As mentioned above, Galić correctly discusses the law related to the principle of proportionality; nevertheless, it applied the principle only once to the facts – sort of. And when it did, it did so without reason because the issue of proportionality could not, in fact, arise for the attack in question. Since the attacking Bosnian-Serb forces could not see the targeted location (a parking lot, surrounded by tall buildings; Galić TJ, para. 387), and were unable to make a distinction between legitimate targets and civilians due to the use of artillery (with mortar shells of “at least 81 mm”, para. 377), the crowd made up of football players and spectators, both civilians and members of the Bosnian-Muslim forces, was targeted as a whole. The strike was thus indiscriminate; irrespective of any expected incidental damage (see more in detail, my discussion on pp 285-286). Then, thirdly, there is the Gotovina case, in which the Trial Chamber more or less applied the principle to the evidence resulting in an evaluation of the balancing test. This case, in which accused were charged, inter alia, with “the shelling of civilians and cruel treatment [and] unlawful attacks on civilians and civilian objects”, was the first and only time that the principle of proportionality was a key issue in an ICTY case. However, the Trial Chamber’s findings on targeting proved to be so problematic for the Appeals Chamber that it quashed the Trial Judgement and fully acquitted the two remaining accused. At the times of firing, […] civilians could have reasonably been expected to be present [near the locations fired at]. Firing twelve shells of 130 millimetres at Martić’s apartment and an unknown number of shells of the same calibre at the area marked R […], from a distance of approximately 25 kilometres, created a significant risk of a high number of civilian casualties and injuries, as well as of damage to civilian objects. The Trial Chamber considers that this risk was excessive in relation to the anticipated military advantage of firing at the two locations where the HV believed Martić to have been present (para. 1910). Curiously, this was the only proportionality analysis made by the Trial Chamber, whilst the circumstances regarding the rest of the strikes were not substantially different. The Trial Chamber merely used this finding as an “indicative example” to support its conclusion that “the HV paid little or no regard to the risk of civilian casualties and injuries and damage to civilian objects when firing artillery at a military target on at least three occasions on 4 August 1995” (para. 1910). The Appeals Chamber criticised the finding on the attacks on Martić, but did not overturn it. By majority, it held that “[t]he Trial Chamber’s analysis of the attacks on Martić involved a lawful military target, was not based on a concrete assessment of comparative military advantage, and did not make any findings on resulting damages or casualties”, but that it did not need to consider whether the Trial Chamber erred in finding that the attack on Martić was disproportionate (Gotovina AJ, para. 82). No clarification was thus given of how the proportionality assessment should have been better applied. Naturally, the Majority was correct in observing the Trial Chamber’s failure to examine the military advantage (at the time of attack) of taking out Martić, and that no findings were made on “resulting damages or casualties”. However, the latter would not have assisted the Trial Chamber. Besides – arguably – strengthening the finding that “civilians could have reasonably been expected to be present”, it should be clear that an evaluation of the resulting damage is by no means necessary for the assessment of the proportionality of an attack (for which the determination needs to be made by the attacker prior to launching a strike) during a criminal trial. In addition, the Majority found that the proportionality finding was “of limited value in demonstrating a broader indiscriminate attack on civilians in Knin” (para. 82). Indeed, the attacks on Martić could not, without more, change the nature of the operation as a whole into an indiscriminate attack. However, the Trial Chamber could have applied a proportionality analysis to more strikes. Rather than determining the accused’s intent to attack civilians by looking at the location where the projectiles had landed (using the “200 metre” rule/standard that afterwards received fierce criticism, see e.g. here), the Trial Chamber could have examined the proportionality of the attacks by assessing the likelihood that the shells and rockets would impact on objects other than legitimate targets, and could thus be expected to cause incidental damage. Using the reasonable commander standard as described in Galić (para. 58), it could then have considered whether the risk of causing excessive collateral damage was too high when compared to the anticipated military advantage. Unfortunately, the opportunity to clarify the use of the principle of proportionality in ICL was not seized either by the Trial Chamber or by the Appeals Chamber. So where does the Prlić finding on the attack on the Old Bridge fit into? Well, actually it doesn’t fit into any of the three categories discussed above. The Judgement Summary (both in French and in English), which is the text that was read out by the presiding judge when rendering the judgement, states that “the bridge was used by the ABiH and thus constituted a military target” and that the bridge’s destruction “caused disproportionate damage to the Muslim civilian population”. However, when one reads the 80 (!) paragraphs of the (French) Trial Judgement (paras. 1286-1366) on the bridge’s destruction, one can derive that the Majority considered the bridge to qualify as a military object pursuant to Article 52(2) of Additional Protocol I (paras. 1290, 1357 and 1363), but no explicit and clear finding on the status of the bridge as a military target was made. This is unfortunate as questions on proportionality when attacking dual use objects (see my discussion on pp 305-306), and whether the threshold for (important) cultural property to lose its protected status when used for military purposes is different from a regular civilian object, are still open to debate. These questions thus remain unanswered. When reading the relevant part of the Prlić judgement, one wonders why no explicit legal finding was made on the proportionality of the attack on the Old Bridge; the law (see paras. 124, 169, and 189) was ready to be applied to the facts. Whether this would have resulted in an adequate application of the balancing test is uncertain. The Majority noted, for example, that the bridge was an important cultural object but its main criticism of the bridge’s destruction was the resulting isolation of the Muslims on the right river bank. However, the judgement sets out that the isolation was only really effectuated by the destruction of the Kamenica bridge a few days after the Old Bridge collapsed (para. 1355). Notwithstanding arguments that if the military advantage of an attack should be that of an “attack considered as a whole and not from isolated or particular parts of the attack” (see, e.g., Canada’s reservations to Articles 51 and 57 of Additional Protocol I), the incidental damage also should take into account the attack “as a whole”, the summary only deals with the specific strike on the Old Bridge. It thus seems that without the later destruction of the other bridge yet having taken place, the correct conclusion – based on the Majority’s own findings – would have been that the strike on the Old Bridge was proportionate at the time it was being launched. In any case, since the summary as it mentions itself is “not an official document”, the Tribunal’s case law is thus – quite unfortunately – still lacking satisfactory application of the proportionality principle. Whereas the ICTY has clarified many IHL matters, the military and academia will have to do, for now, without any clarification on this issue. Thanks for the interesting post. Why was the international armed conflict determination in the Dordevic case an obiter dictum? How can the nature of the armed conflict not have been relevant if Dordevic was charged with war crimes? You might want to read Tome 3 of the Trial Judgement which actually contains the legal findings and the evaluation of the proportionality. In particular paragraphs 1580-1587 and the last sentence in paragraph 1582 stating that the Old Bridge was a military target (“Le Vieux Pont constituait par conséquent, au moment de l’attaque, un objectif militaire”). @ anonymous: I will start with your comment. Thank you very much for pointing this out. Based on the indictment and the final trial brief, I had – as I now realise, mistakenly – looked for such a legal finding only under count 21 (and 19). My sincere apologies to the drafter(s) of the summary (and the Majority) for this incorrectness. This makes the judgment all the more interesting though. It also enables me to elaborate a bit on my remark on the indirect/longterm incidental damage. The proportionality balance involves “incidental loss of civilian life, injury to civilians, damage to civilian objects, or a combination thereof”, but how indirect this harm may be is far from settled (see Henderson’s excellent (over)view in his “The Contemporary Law of Targeting” at pp 207-211). If the (makeshift) Kamenica bridge, which was still standing at the time of the attack on the Old Bridge, would not be taken down, the damage (apart from the effect on the morale) would not result in the same way (as the Majority concluded that it was actually the destruction of the Kamenica bridge that caused the isolation). Whether the military advantage of disrupting the ABiH supply lines and preventing it from carrying out operations would outweigh the future humanitarian harm to the civilian population if the Kamenica bridge would not afterwards have been destroyed, is maybe debatable. Of course, the attacker (or the one ordering the strike) could well have known that soon after the last crossing would be taken out, and then there is also the damage to the historic bridge itself. Whether it would rather be the attack on that last bridge that was disproportionate instead of the strike on the second last bridge makes for an interesting discussion point. 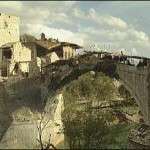 The Chamber considered the Old Bridge’s destruction, similar to the destruction of numerous mosques in Mostar and other villages, as wanton destruction of villages and towns or devastation. The Gotovina Appeals Chamber that “it need not consider Gotovina’s assertion that the Trial Chamber erred in finding that the attack on Marti} was disproportionate”, but it did mention that the finding “was not based on a concrete assessment of comparative military advantage, and [that the Trial Chamber] did not make any findings on resulting damages or casualties”. In that light, it will be interesting to see what the Appeals Chamber will say about the attack on the Mostar Bridge – if contested on appeal. @ Freely: Thank you for your comment. Dordevic was charged with murder under Article 3 of the OCTY Statute and as prohibited by Common Article 3 of the Geneva Conventions, i.e. in a non-international armed conflict (NIAC). In Tadic, the Tribunal made clear that war crimes can be perpetrated in NIACs. But for the Tribunal’s jurisdiction only the existence of an armed conflict generally has to be proven. The nature of the armed conflict only becomes relevant if grave breaches are alleged (as these can only be committed during an international armed conflict) or when the existence of an (non-international) armed conflict is disputed and it is claimed that the accused were merely combating terrorism (like in Boskoski and Tarculovski). Since no grave breaches (or other alleged crimes in an IAC) were charged, the Chamber’s finding that a NIAC (which is also what the Prosecution led evidence for, namely on the intensity of the violence and organisation of the parties) existed at the relevant time would have sufficed. Moreover, the crimes where only committed as part of the NIAC between Serbia and the KLA, which are unaffected by the nature of the parallel conflict between NATO and Serbia. The finding on the existence of an IAC was nonetheless interesting and relevant since – as noted by Dov Jacobs in the link above – it was the first time that a judicial body made such a finding. What was the burden of proof applied in this case? Given that it was a civil law background judge presiding do you think that decision might have been different if a common law judge had approached the decision from the perspective of a ‘beyond reasonable doubt’ standard of proof? So the bridge was used to transport weapons and humanitarian goods. Isn’t the risk for it being attacked on the side of the army using it for military purposes? The tunnels that Hamas uses to smuggle weapons into Gaza are occasionally used to get food or civilian products in, but when no civilians are in or around the tunnels surely all of them can be bombed as military targets without having to consider proportionality? @ David: The Presiding Judge (Antonetti), who indeed has a civil law background, actually did not join in this part of the judgment. However, the Majority was made up of two judges who also have a civil law background. Nevertheless, I don’t think that the civil (or common) law background of the members of the bench matters here. The judges’ background may affect the way in-court proceedings are conducted (e.g. allowing for objections, the bench being active in questioning witnesses) and perhaps it influences decisions on procedural matters (or the introduction of the underlying Rules of Procedure and Evidence, which are adopted by the plenary of judges), but according to Rule 87(A) “a finding of guilt may be reached only when a majority of the Trial Chamber is satisfied that guilt has been proved beyond reasonable doubt”. So even if findings do not explicitly state that the chamber concerned is satisfied that the evidence shows “beyond reasonable doubt” that the accused intended something, it has to be assumed that this is the standard that was applied when reviewing the evidence. The Prlic Majority’s review of the (substantial amount of) evidence was very elaborate and there is no indication that it was done to another standard than “beyond reasonable doubt”. That being said, establishing criminal response for a violation of the proportionality principle is very difficult. The Galic Trial Chamber held that “[t]o establish the mens rea of a disproportionate attack the prosecution must prove […] that the attack was launched wilfully and in the knowledge of circumstances giving rise to the expectation of excessive civilian casualties” Galic TJ, para. 59). Proving the knowledge is not easy. Geoffrey Corn (South Texas Law School), who testified as an expert in Gotovina, proposed to treat the criminal application of the proportionality principle in the same way as the common law concept of implied malice in murder. Furthermore, in Prlic, the question whether the destruction of the bridge was proportionate arose in relation to the crime of wanton destruction of cities, villages and towns, not justified by military necessity. This adds another layer of elements that need to be proven as the fact that the attack was disproportionate only relates to one of the elements of that crime (i.e. the element that the destruction was not justified by military necessity). Nobuo Hayashi explains the relation between (absence of) proportionality and (lack of) military necessity with respect to destrcution of property really well in: http://www.bu.edu/law/central/jd/organizations/journals/international/volume28n1/documents/39-140.pdf, pp 114-122). The tunnels are military in nature only (and may be occasionally used for humanitarian purposes), the bridge is the other way around. What about the fact that the bridge was cultural property? And how is the civilian value (for the balancing) measured? If the later humanitarian consequences for the Muslim population made the attack on the bridge excessive collateral damage, would it then have been legitimate if the Croats had plans to drop food and other humanitarian goods from the air for the remainder of the war? That would be crazy but follows from such a ruling.